A seventh season in the basement now loomed for the Clarets and left fans wondering whether we would ever get ourselves out of this league via a promotion. We'd ended the season seven points clear of Torquay but that had counted for nothing. The damage had been done in the first leg at Plainmoor as we went down 2-0. That was a bad day for Burnley when not many of our fans were able to get tickets for the game with our club coming to the rescue by showing it on a big screen on the Turf Moor pitch. Over 4,000 watched on a screen that had been badly placed in front of the goals at the cricket field end. At Turf Moor in the second leg we battered the Devon side but too often played into their hands as their central defenders, Wes Saunders and Matt Elliott, dealt with a constant barrage of long balls from the Burnley team. The writing was already on the wall for Burnley when our local rivals sent over a plane. It's more commonplace now but 21 years ago it was a bolt out of the blue as the aircraft came over carrying the message 'STAYING DOWN 4 EVER LUV ROVERS HA HA HA'. We did eventually score via an own goal from Stewart Evans but that came in stoppage time and too late for the Clarets to get another goal to take the game into extra time. Torquay went on to win the final and with it promotion, and to this day it remains the last time we've played them in a competitive game. Fans reacted badly to the defeat. Mr Chew, a Burnley supporter from Halifax and on behalf of Burnley fans, wrote: "Yet again, these people have been let down by a Burnley side which flattered to deceive and has been found wanting on the big occasion." Steve Rapson of Sutton Coldfield didn't wait for the second leg, so angry was he after the defeat at Torquay. He hit out at the team's poor discipline. "Without scrutinising the rest of the division I think I would be on a pretty safe bet that Burnley FC have the worst disciplinary record in Division Four," he wrote. "Come on Mr Teasdale, if we really are to get out of this division then discipline right from the very top is what's needed. The supporters aren't asking for discipline, we demand it." Burnley had given everything in that second leg, but it wasn't enough. Edward Lee, for the Burnley Express, wrote: "On any other occasion Burnley would have won a standing ovation for their commitment and endeavour, Indeed, if commitment, effort and enthusiasm won games the Clarets would have been 10-0 winners, but the difference between efficiency and effectiveness could not have been more stark." He added: "It was clear that the game was won, or lost, depending which side of the fence you were sitting on, at Plainmoor on Sunday." In front of a Turf Moor crowd of 13,620 it was another season that had ended in failure, failure to get out of the bottom division of the Football League and it left fans questioning the chairman, the board, the manager and the players with many wanting to see the removal of most of them. Manager Frank Casper was the main target. 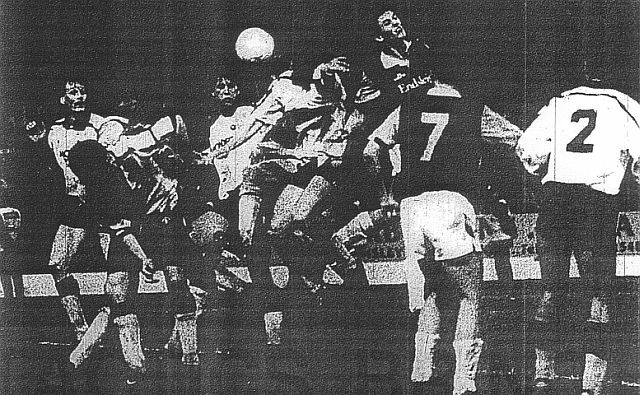 Our team that night was: Chris Pearce, Ian Measham, Ian Bray, John Deary, John Pender (Danny Sonner 69), Steve Davis (capt), Andy Farrell, Ron Futcher, John Francis, Joe Jakub, Roger Eli. Sub not used: Ray Deakin. It was an awful night for Burnley but success was not far away. We wouldn't be staying down 4 ever as some would like to think. This was the start; the start of a year that would see Burnley's progress back up the leagues of English football get underway. It is the start of a new feature on Clarets Mad entitled 'Burnley are Back' and that's exactly what we were a year later when this story comes to an end. We'll keep you up to date with all the transfers, in and out, during the summer of 1991 and the pre-season games before looking at the 1991/92 season, match by match, in detail, a season that left us all singing 'Burnley are Back'.